A medium sized wild cat of the Northern Hemisphere, lynx is a beautiful and elusive feline. 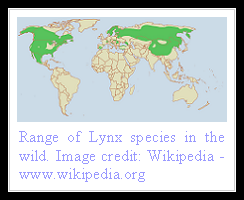 Classified into four subspecies in lines of its appearance and distribution, lynx is seen in a number of countries of Europe, Asia and North America. A large wild cat, lynx weighs in the range of thirty to seventy pounds, with the size varying across the subspecies. The word 'lynx' is Greek is origin and means 'to shine' - a possible reference to the cat's bright eyes. Other characteristic features include large paws that assist in walking on snow and a short tail. 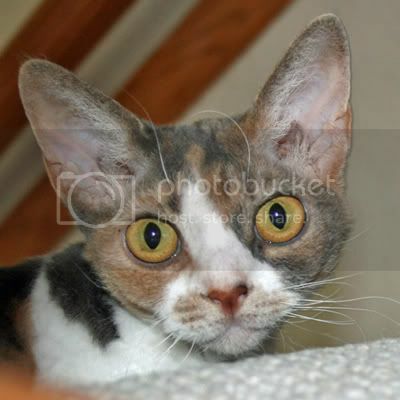 Neck has a thick ruff of hair around it and ears are tipped by black ear tufts. Whiskers are usually long and prominent. Coloration varies with habitat and is usually brownish gray, with the fur often being spotted on limbs. 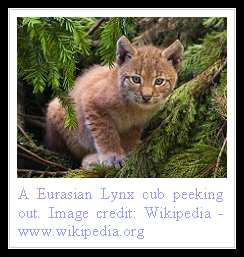 An inhabitant of mountains and dense forests, lynx usually lives in thick shrubs and bush. Capable of an arboreal and aquatic style of hunting, lynx usually stalks and ambushes its prey on the ground. Co-operative hunting has been observed between mother and kittens and prey of various size are brought down in this manner, ranging from hare, rodents, fish, birds, sheep, goat and deer to reindeer. Sight and hearing is usually employed to close in to prey, rather than scent. Lynx prefers to ambush and pounce upon its prey from a close distance, like a leopard, rather than sprint after it like the cheetah. Largely a solitary and reclusive cat, lynx usually mates in winter and a litter of up to four kittens are born yearly. Independence is reached at nearly one year of age. Owing to their shy lifestyle lynx seldom are seen in the wild and rarely come in contact with humans. Attacks on humans are very rare and are usually in a defensive rather than offensive intent. Lynx faces a variety of threats in the wild including habitat encroachment and poaching for fur. It is considered endangered in certain portions of its territory, with hunting and trade in its body parts illegal in many countries. There is some hope for the future though, with recent increase in sightings and evidence of reduction in the number of pelts traded annually. Wonderful timely post. I tought lynx and bobcats were different animals (one had no spots, the other did). But I see they are the same. I see them here. They live on the mountain above me and we can hear them at times (scares the housecats to death!). Thank you. My favorite part of the lynx are the cool ear-tufts. I had no idea the Bobcat was a type of lynx. Hello, hope you're keeping well. Just a question, Is there a difference between the cats: Lynx, Mountain lion and Cougar or are these just different names used in different areas? @ African Safari Stories - thanks for stopping by. Mountain Lion and Cougar are different names of the same cat - Puma Concolor. Lynx is a different feline species - smaller and more widely distributed across the world than the cougar. It is further divided into four subspecies: Eurasian Lynx, Canadian Lynx, Iberian Lynx and the Bobcat. im doing a report on lynx and i think they are awesome! the person just trying to mislead me? Thank you. I have a russan blue cat with no tail. Could this be a russan blue with no tail ? I have a russan blue cat with no tail . Could this be possible ? I had no Idea Bobcats were lynx. Is having short tails a feature that ALL lynxes have or can some have longer tails? Some time ago, while doing work on a new home in the middle of a forest, I found 4 small kittens, all having very short tails. I took them all to a vet who told me they appeared to be about 2 weeks old and that they were known as Pixie Bobs. After having them checked for disease, I kept two of them and bottle fed them until they were ready to eat solid food. My patents took one and I the other. I have had her for 9 years now and she has been the most loving cat I have ever called my own. She has the markings discribed here, the same hunting habbits..she is very territorial, and often comes home with a rabbit larger than herself. Physically, she is as discribed here..large paws, rather large ears with the dark tufts of hair that have longer hair growing out of and curling back from her ears. Her eyes are bright yellow-green. She is dark brown with black spots but white on her underside and inside her legs. Her tail is 2 inches long and black in color. Wish I could post a picture of her here..she is a very beautiful animal! What a wonderful story Alan. Thanks for rescuing the kittens. Hope you share many more wonderful years with your beloved cat. Thanks so much for letting me know. I am the person though who posted this article on that website too as part of the promotion of my work. This is called article marketing and is done for gaining links to your website. can a bobcat mate a typical house cat? This one is deffinetly the body size and color, and eye shape, but the ears don't quite look the same. It slinks around my small farm yard at night. Its the only one I have seen in the area, Country Amish, in NY state. Do you think that 3 lynx should be kept in a cage within the city limits of a town? Are they not considered a wild animal? I feel that they should not be confined and they should be out in their own natural habitat. I am an animal lover, and especially of cats, they are beautiful mysterious creatures. It is sad to see them caged up.